So have you ever tried to dismantle one of these beasts? You’ve found the perfect inspiration for a pallet project on Pinterest, so you drive until you see a stack and stuff it in your backseat only to get it home and realize that they are SUCH a pain! But that’s the price of free. So why are they such a pain? Those nails can be rusty, spiral, or ring shank (they have barbs). And since they’re made out of scrap wood- some of the pieces could have old nails that have just been bent over at the back. And the wood? 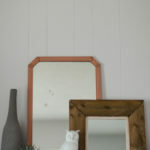 It’s scrap wood, so it can have bark, hard knots, and most frustrating of all- it’s dry so it cracks so easily! Like video tutorials? Subscribe to my YouTube channel for more! So now you’ve had a peek at my backyard (it needs some love, that’s on our list for next summer). Just so we’re realistic about this- it doesn’t take two minutes for pallet disassembly, it takes about 45 minutes. I’m sure you realize that, but I thought I’d just make sure. I don’t want anyone coming back upset that it took them more than a few minutes to take apart a pallet without a saw. Something to keep in mind- I always prep my wood before I use it in a project. That means I sand it and clean it, so don’t worry too much if you get some splinters around your pry marks- you can sand those out. 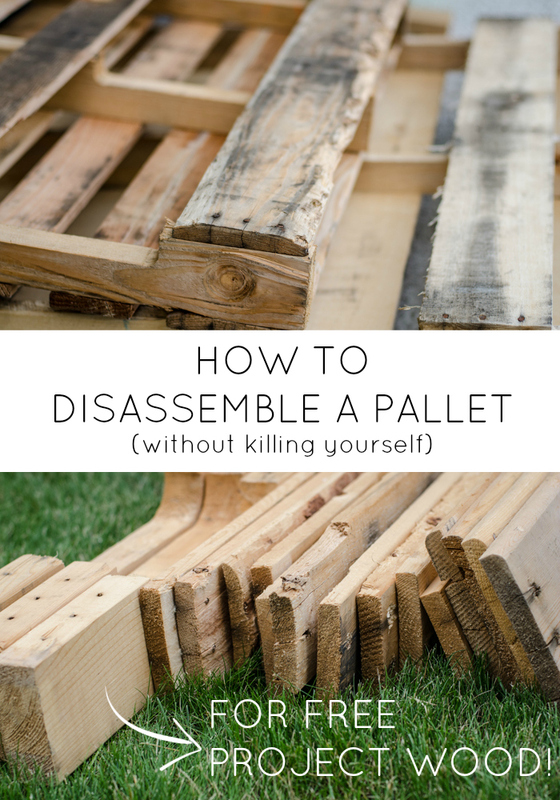 I hope you enjoyed this tutorial on how to disassemble a pallet without a saw! So needed this! Sharing on Facebook! Thanks for linking up at Your Designs This Time! To add leverage pulling out the LONG nails, put a block of wood under the heel of the hammer as it keeps the nail straight. A bent nail gets harder to pull out because of added resistance. You make it look so easy! We ended up cutting ours apart with a saw, cutting through the screws. Like a bad blogger I haven’t used any of it yet, probably because I still have to remove the portion of the nails that were left in. I need a personal training session on this apparently! That would work too! Probably a bit faster than this too… did you have a bunch of waste to deal with? I have a pile of it sitting to be made into something too… Always be prepared, right? The old nails can look so cool! 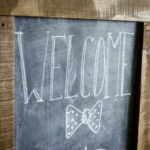 I’m so glad you share this at Frugal Crafty Home Blog Hop! I have a pallet that I’m saving so I’ll have to remember this when I’m ready to disassemble it! I would totally be the kind of person that would get really injured taking one of these apart! Pinning this now! This looks fun! Thanks for sharing this! Wow this is awesome information! I have always struggled with this. Thanks so much for sharing. 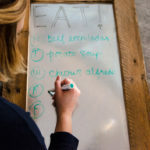 I’m stopping by from the DIY Inspired link party and I’m glad I found your blog. Pinning this and following you on social media! Don’t know if it’s just on my ipad browser, but this comment form has no labels!? Just 3 unnamed short fields followed by a text box. I am only guessing which field is for my name, and email etc, and hope I didn’t just publish my email. I Ijust had a look at your vieo, and while you do a god job of getting a pallet apart without a reciprocating saw (sometimes known as a sawsall),I have to say, that if you are doing this on any sort of regular basis, it is WELL worth it to invest in a reciprocating saw. As it turns a 45min (as you said) job into approximately 10 mins. I use a mallet first and give the joins a good wallop with that to loosen them up. You need to have a little space between the sections of wood, so that you can easily slide your saw between then and cut just the nails. If it takes more than 2-3 seconds to separate each section with a saw then you probably aren’t just cutting nails and may need to loosen things up with a mallet first. You can also use a hammer, but a mallet does a faster, better job with less effort and leaves less indentations in the wood. For anyone who is planning on breaking up more than one or two pallets, a reciprocating saw is well worth buying. 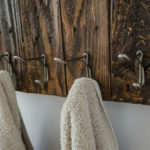 It’s also a handy tool to have when making whatever you are planning to make with your pallet wood. Also, on some pallets, whacking the top of the blocks that are used as supports, with your mallet, is useful to loosen them up when trying to get them off those last few planks of wood. Seriously though….get a saw…. When you do you will ask yourself why you waited so long to do so. Then get a mallet and some blades which cut both metal and wood, so you aren’t changing them all the time. Hi Kim, Thank you for the comment! I am not sure what is happening with the comment form, but you have your email in the right place! My site is being moved to a new server right now so that could maybe have some glitches with it. 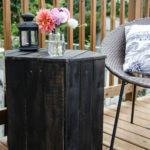 It is a bit time consuming, but if you don’t have storage for a saw, or are looking to create pallet projects because there’s no cost (and don’t have the funds to buy one), this is the best way I’ve tried! We’re working on a pallet wall for our basement and now that we have a house with a yard (and shed), we’ve invested in a saw to do exactly what you’ve said! I think I just commented on about the exact thing you are saying. Using a saw is the way to go. I tried that, but I have MS and limited strength in my arms and hands. I got a hold of my husbands reciprocating saw, bought some “deconstruction” blades, and I just cut through the nails. Then I tap out the nail pieces with a little pick and a hammer. Thanks for the comment Krista! We’ve been using a saw on pallets for our basement pallet wall. With limited space in our previous apartment, our tools were limited (as was our budget!) so we stuck to a power drill, hammer, and pry bar. A saw is definitely handy. Please be careful when working with these pallets! First of all they are very dirty (even if they are supposed to be cleaned), wear safety goggles. Our son was taking one apart, forgot his safety goggles and a piece from the pallet hit him the eye. He lost the sight in that eye. The foreign object was tested in a lab and had rat feces on it. Hi Bon, I’m so sorry for your son’s experience! Safety glasses would definitely be a good idea. When we work with a saw we use them ever time, I haven’t working with a pry bar, but will think twice next time :) Thanks for the comment. I find it odd that they would need to test the “foreign object” at all – given that they already knew what it was … & surely it’s common sense to use safety equipment when working with tools, or when re-purposing materials that that have had earlier lives outdoors? ..
Safety glasses should always be worn when hitting objects (either wooden or steel) with a heavy hammer or pry bar. My Father and I were splitten wood with steel wedges and a sledgehammer when a small piece of the wedge chipped off and flew right into my Father’s chest. Superficial wound, but could have been hit in the eye just as easy too! Always wear safety glasses, as you can’t replace an eye! Also, you can use a multi-tool (like the Fein brand, or many others), Harbor Freight Tools sells them for less than $20 on sale, then use the carbide blades which cut through nails like a hot knife through butter! These tools oscillate at 20,000 to 35,000 rpm and make a lot of noise, but they are pretty small, lightweight and easy to use. The blades are thin and will slide between the boards with ease to cut through the nails. They also make smooth cuts so the cut nails feel like they have been sanded smooth to the surface of the wood. Doing motel maintenance for the past 38 years, I have found this tool to be the most versatile, useful tool I own! Thanks for the information in your article. Very useful. I’ve heard of some multi tools like that (dremel makes them too I believe) and have one on my wishlist! So I have tried a similar method and found that my lack a patience and grace with a hammer leads to me breaking boards that could be used. The quickest and easiest way and I have experienced is to use a sawzall (reciprocating saw)with a long metal cutting blade. The blade is thin enough to work its way between the boards with out cutting them (a little scuffing is to be expected) and I just cut right through the nails holding them together. On average it takes me about 3-4 minutes to completely disassemble a pallet. Y’all are crazy. Dont make this complicated. 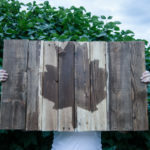 Call a local recycled pallet company. Offer them $.25/board for boards 40″ and longer and $.50/stringer–they’ll be happy to sell you some. I’ve been in the pallet industry for 12 years, let people with the correct machinery do the work. 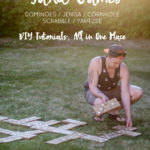 I don’t understand the infatuation (other than they’re free) with using dirty pallet wood for projects. Most of the pallets are either chemically treated or have some other poisons/filth in or on them. Folks are putting themselves at great risk handling, sawing and sanding this dirty wood. 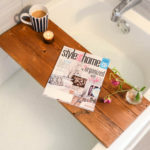 I cringe seeing pallet wood ending up as indoor projects. 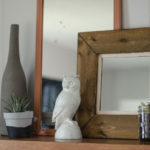 I’m a hobbyist woodworker and would never touch the stuff nor have it around the inside of my home. Yuk. There’s definitely two sides (love and hate!) to the pallet trend. This year is the first year we would have been able to afford purchasing lumber for any projects so we are team pro-pallets for the price tag alone. I had her favorite picture enlarged in black and white, had the pallet dried and ready and couldn’t take it apart in useful pieces. Argh! Hopefully this helps me dismantle it! Thank you so much! If you put a 1 inch thick piece of wood (say a 6 inch long 1×2) under the “rocked” portion of your pry bar, you will get significantly more leverage. Yes! I use that trick a lot now, I wish I’d learned that sooner- I should update the post with that tip, thank you for chiming in! Thanks so much for sharing this! 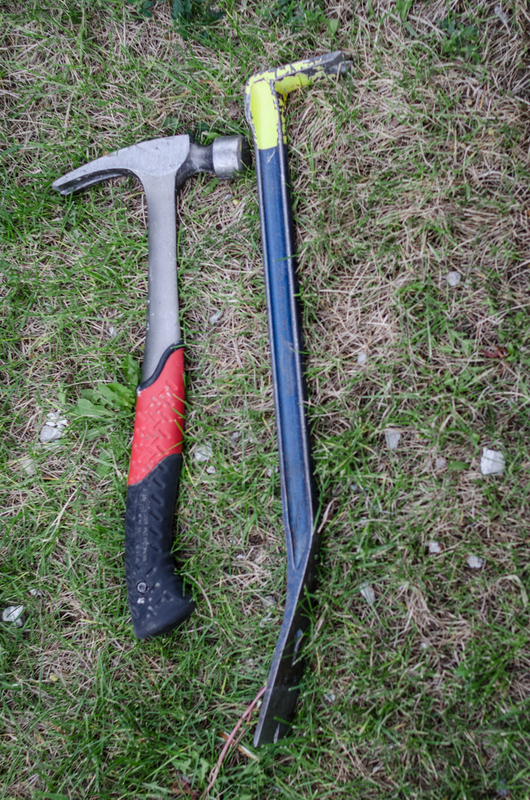 I just got home with two pallets and tried to take them apart with just the claw on a hammer lol – the pry bar makes WAY more sense :) Heading out to get one now! Lot of good ideas in here. If you use a wrecking bar (sometimes called a crow bar or, if you’re in Appalachia, a “pries bar”) it already has built in cantilevers. It sort of looks like a shepherd’s crook. Might find one at a yard sale, but they’re not that expensive new. They come in different lengths, so maybe you’ll need more than one. NB: don’t pry one side completely off; go back and forth from side to side so the wood has less of a probability of splitting! Great tips! Thanks for the comment. Car jacks are amazing for this!!! How do you deal with all the splinters? My pallets have a lot of split wood and splinters. Great question! I’ve had a few that are nasty like that as well. I think it’s just about picking the ones that are more solid. Also, a good sanding (and picking off the big splinters) will help. Dismantling the wood..So far, I don’t mind, dispite the fact I have a physical medical condition .. it’s a hobby I have recently started. It’s been a year..I learned on my own how to work with the wood without smashing every board .. but will still work with the broken peice .. I had no idea about Pinterest until a friend of mine told me about it. . It makes me laugh because I did mine the same way. Yes! Always clean them up- I agree. I usually sand with a 60 grit to knock stuff off to start. 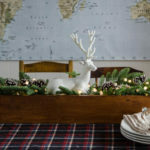 I love the idea of making projects to pass along to friends and family- you have some lucky people in your life! Hello, didn’t see this tip in the other comments.. Using a rubber mallet with the pry bars deaden the loud sound and vibration on your hands. The claw part of the pry bars will also cut through the nails when hitting them with the mallet. ( for the stubborn nails that don’t want to loosen up) Also I re-use the old nails to give more characters to each piece and plus they’re free! A rubber mallet is a genius tip! The vibration on my hands bugs me the most about the whole process. Thanks for the tips! Thank you for showing this. I don’t have a pry bar. I just used my hammer and I must say it turned out pretty good. Since I was limited on nails every board I pulled off I was able to salvage some of the nails for reuse. I made myself a gate to close off my fence so that I could let my dog Roscoe roam around in the front yard. When I am able I’m going to get myself a circular saw for future projects. So look out for my next project a screen door so that I can open my doors and let in fresh air. That’s awesome! You’ll love the circular saw- it’s so versatile. It’s what we used for pretty much every project for the longest time. I have tried pry bars and sometimes it works. Instead get a good hacksaw with a fine tooth blade, only slightly loosen the board, then cut the nail with saw, its a piece of cake. Three-four cuts and the nail is done. 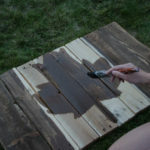 With practice, you can do a pallet in 12 minutes or less. Very little effort and all wood is good, no splitting as happens when using a pry bar. I have a deck wrecker. So much easier and you don’t have to bend over. Home Depot and Lowe’s have them. I used a saws all. Cuts right through those nails. Easiest way that I have found. Totally! That would be the preferred way if you have the tool. Hi, I just wanted to say that I didn’t come here looking for a way to easily dissemble a pallet. I did click on this post however, due to the unsettling fact that you had the desire to add in “without killing yourself”. Whether or not it is joking about suicide, some people may take it that way. It was very inappropriate to add. The title could’ve been anything else but you chose to say that. Being someone who suffers from depression and suicidal thoughts, it was very triggering and upsetting to see this All I ask is that you change the title and think of something else. “Killing yourself” is not a joke and never will be one so please, for me and other people who suffer, change the title. With all good intentions, have a nice day. Thank you so much for this video! I love the aesthetic of wooden pallet pieces and I have a stockpile of projects I have been working up the courage to tackle. Up until your video, I have only seen step-by-step instructions; a how-to video is much more effective for visual learners like myself. I live in a small apartment with limited space and not a whole lot of money for for power tool investments, much like you have described your 5 years of apartment life in this post. With space and money limitations, accompanied by a 4-year-old running around, I need some sturdy pallet decor to stand up to our lifestyle. I have found using a tool called a “deck wrecker” is much easier than a hammer and crowbar. And easier on the back. I use a 2 lb hammer with a flat bar place the bar claws in toward the nails and wack hard typically this cuts the spiral nails off or pushes them out. I have the pallet standing on their side and do all along the 2×4 then rotate the pallet 90 degrees and clear all the nails down the center 2×4. I then pop the sides the same way or lift the board up and out this pulls the nails out. A standard 40 x 42 pallet will take 10 minutes with minimal cracking. I choose the pallet for the job so if there is loss I am ok with it. For the scrap pieces I use for outside fire pit and clean the nails later. Hi there, I watched the video and read a few comments. A recip saw would be useful but not necessary. I would like to suggest that a person should have a pry bar like the one used in the video or a thinner wider one to pry the nail up. Then get a longer pry bar to pull the nail up. If you don’t want to buy another pry bar, you should put a piece of wood under the pry bar to give you a bit more leverage. I take out all the nails so that I don’t ruin any of my power tools or hurt myself.